RecipeTips.com's video demonstration, 'Testing a Candy Thermometer for Accuracy,' is an easy-to-follow guide for testing your candy thermometer for accuracy. Hi! 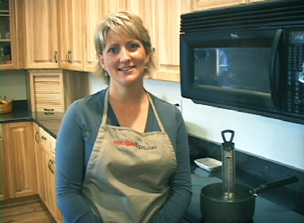 This is Laurie from RecipeTips.com, and today I am going to show you how to test your candy thermometer for accuracy. The cooking temperature of some candies is very important, so making sure that your thermometer is accurate is critical. To check the temperature of your thermometer, place a pan of water on the stove and bring it to a boil. Once the water is boiling, place your candy thermometer on the edge of the pan, and an accurate thermometer should reach 212 degrees Fahrenheit. As you can see, this thermometer only reaches 210 degrees, so to adjust that when making candy, if the recipe calls for 250 degrees, I would need to adjust this to 248 degrees. For more cooking tips, visit RecipeTips.com.